In June 2014 I attended The 11th International Congress on Noise as a Public Health Problem in Nara, Japan. The conference was organized by ICBEN (International Commission on the Biological Effects of Noise). I travelled together with my supervisor Gunn Marit Aasvang and another PhD student at my department, Kjell Vegard Weyde. My PhD mainly deals with epidemiological research on the effects of traffic noise on sleep. Hence, this was an important conference for me to attend and I am very grateful that EPINOR made my travel there possible. I had submitted two abstracts for this conference. One was accepted as an oral presentation and one as a poster presentation. In the oral presentation I presented findings from my PhD regarding the relation between traffic noise and sleep disturbances. 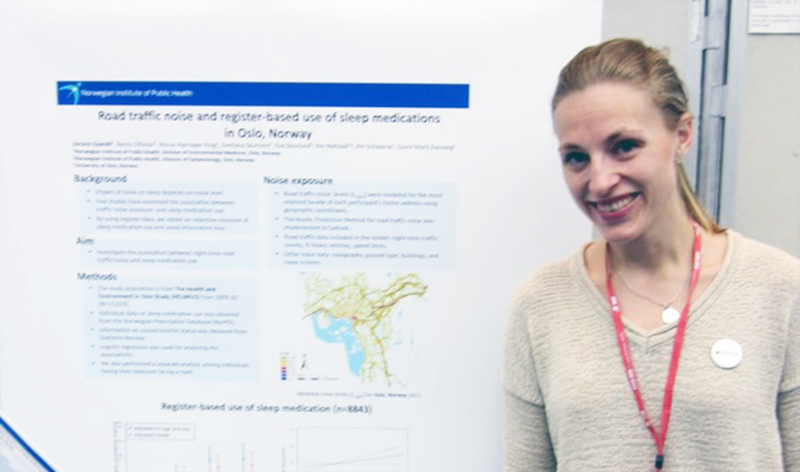 The poster presentation was on the relation between traffic noise and use of sleep medication according to the Norwegian Prescription Database. It was a valuable experience to present parts of my PhD work in front of an expert audience and it was interesting to get some input from other conference participants. In addition to the scientific program, there was a social program with guided tours of Nara and a conference dinner. Nara is a rather small city, something that was convenient for socializing with other conference participants during spare time. The social aspect of the conference was a great opportunity to network with other researchers and policy makers in the field of noise and health from around the world. During the closing ceremony of the conference, five young scientists received a “Young scientist award” for their contributions to the conference. A very nice surprise was that I turned out to be one of the awardees – a great inspiration for my further research. The conference venue was located inside the Nara Park, a very nice park where deer walk around freely. If you feed the deer “deer-crackers”, bought from one of the vendors in the park, they will flock around you. Nara is particularly famous for its Giant Buddha statue, a 15 meter high bronze Buddha, housed in the Todai-ji temple, located close to the conference venue. Although the main reason for my trip was the conference, a special added value to the trip was all the amazing things I experienced just by being in Japan. I got to attend a Japanese tea ceremony, enjoy great Japanese cuisine, and be present at a Buddhist worship ritual for mentioning some. Thanks again for the financial support, EPINOR. I have learnt so much from attending this conference, which I am sure, will be very useful for my future career.